There is no question that a majority of the working population will complain about their work once in a while. It might be a day when nothing went well in the office or when you’re struggling to complete impossible deadlines for your clients. Some people may even be perpetually unhappy in a job they have grown to despise. What they don’t realize is that, there are people in the world who have astoundingly difficult jobs and they put their lives at risk just by coming into work. 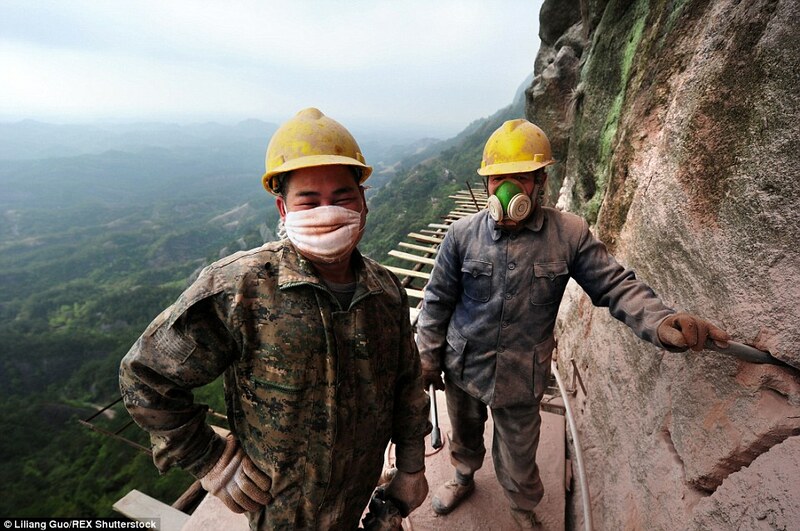 Think about having to work on the face of a cliff, thousands of feet above ground. It is extremely risky and not a job for the feint of heart especially when the only safety equipment you have is a hard hat. 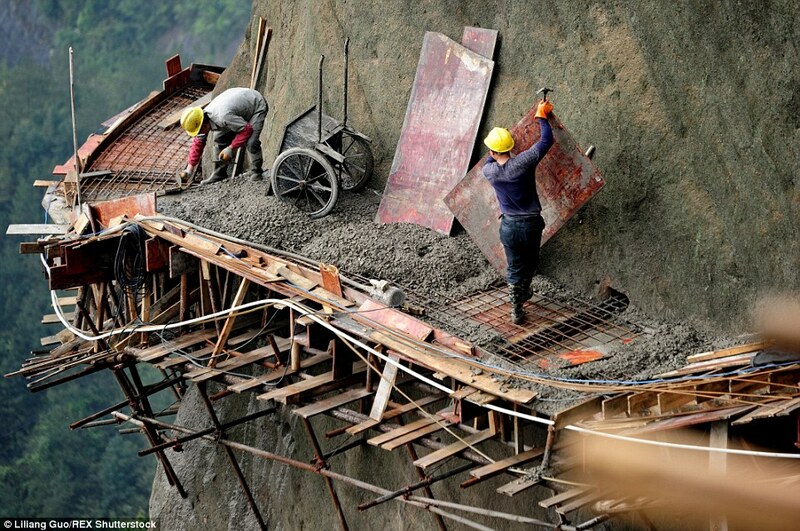 This is exactly what construction workers in Pingjiang, Hunan China are faced with everyday. 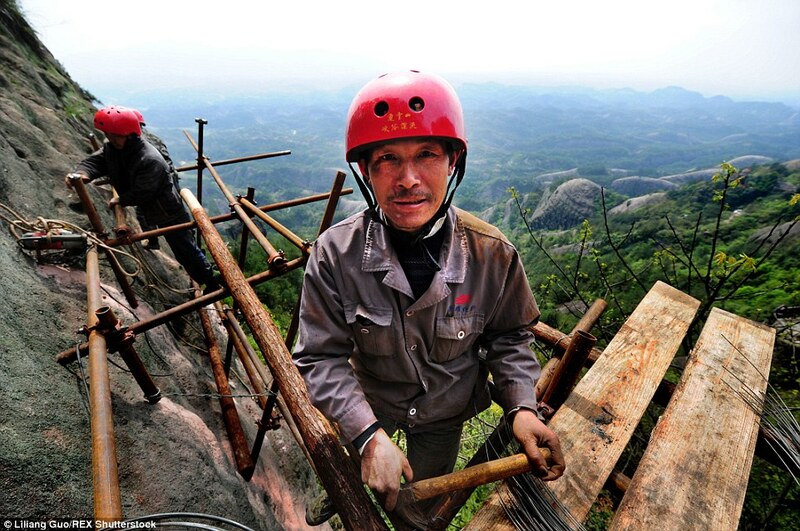 The small region of Pingjiang is home to the Mufu mountain range. The community decided they would use these mountains to their advantage by creating difficult and risky pedestrian routes on the mountain-side to try and attract the attention of adrenaline-seeking tourists. The Chinese officials are hoping that once these routes are complete, they will attract thousands of tourists to the area. 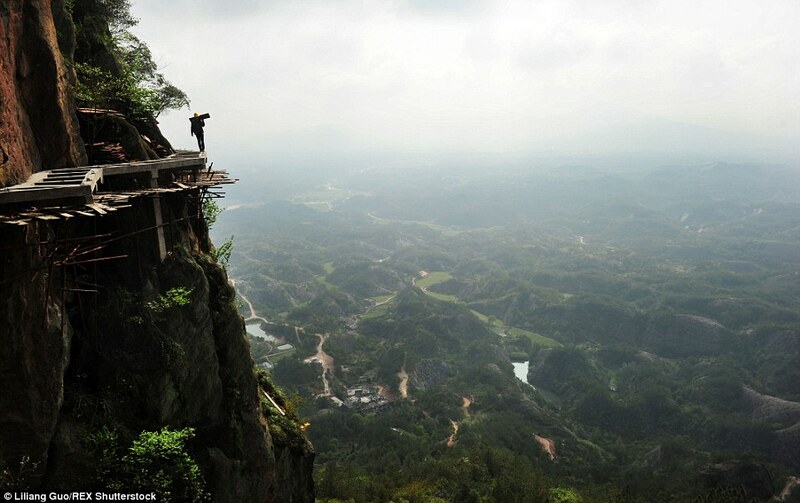 The Pingjiang district is home to some of the most stunning views that will make many gawk in awe. These landscapes are best seen from a height and this is exactly what the cliff-side routes are for. 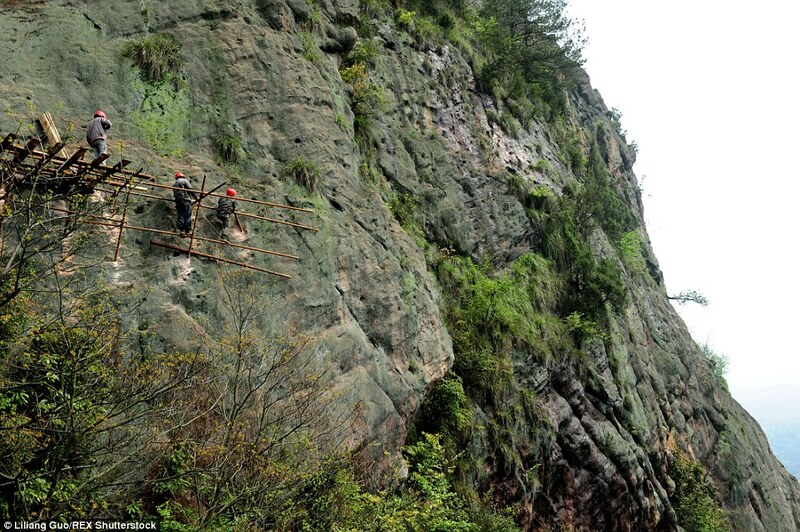 Pingjiang is already well-known for the Mufu mountain range as well as it’s national park. These sites have become popular tourists attractions over the years. The local authorities are trying to capitalize on their existing popularity by building trails on the face of the mountain. 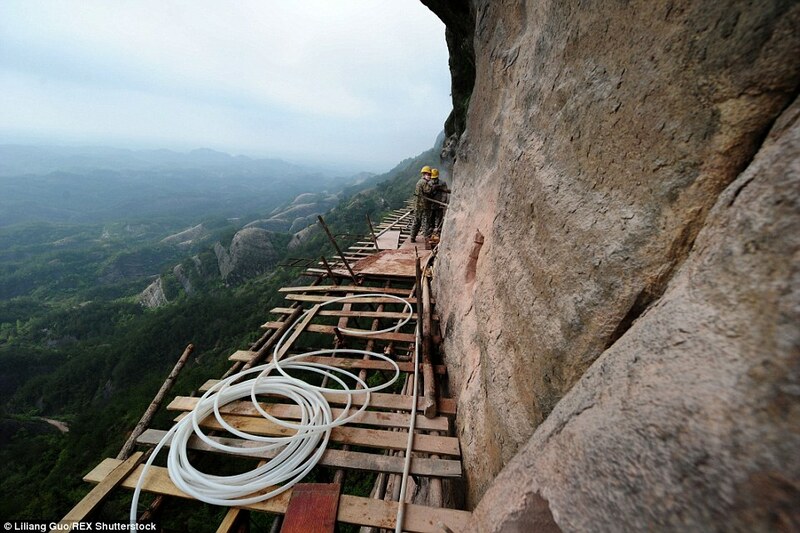 Once complete, people can literally walk up the mountain-side and take in the view all while getting your heart pumping. 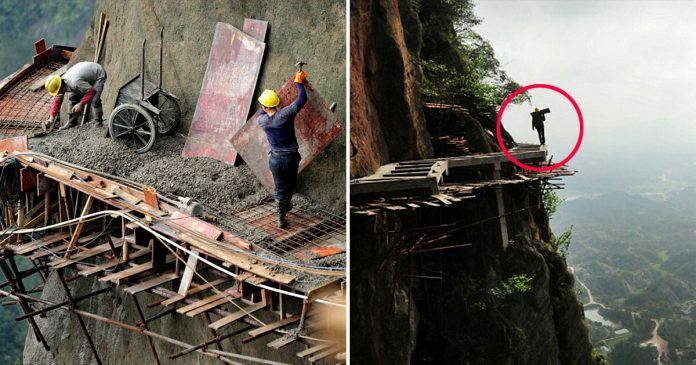 The specific coordinates of where this walkway is being built has not been released as of yet. It does bear a striking resemblance to a similar mountain path which is being built along the face of the Shifou Mountain. 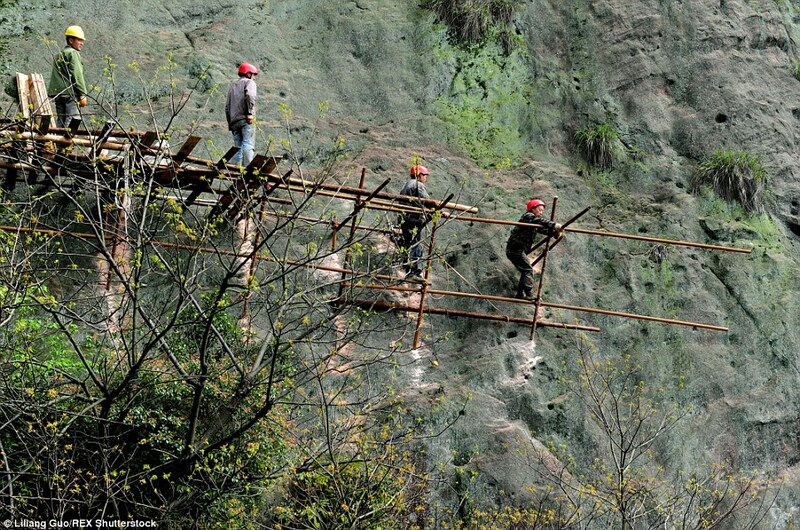 It is located in the nearby Jiangxi province. Once this path is complete, it would come up to a total of two miles in length. 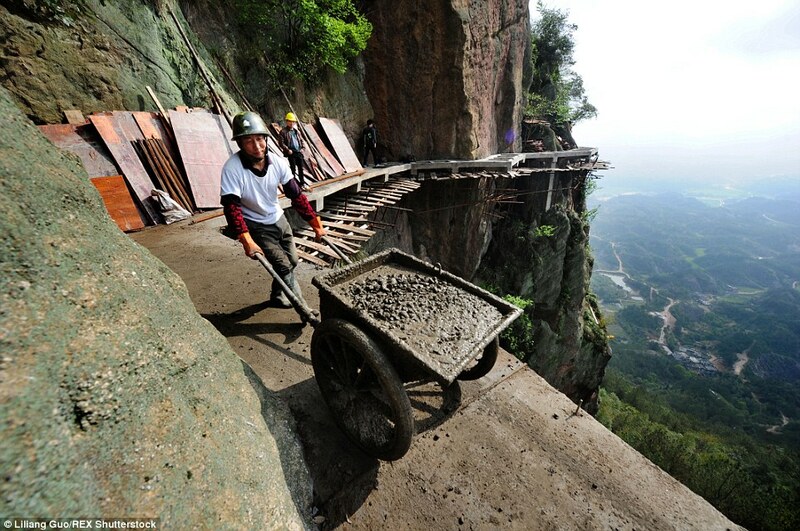 This walkway which stretches around the cliff-side of the mountain would make it China’s longest mountain sightseeing road. Pingjiang had also recently opened a glass-bottomed walkway in 2014. It is actually a suspension bridge that stretches between two mountaintops and it is suspended over 600ft above the ground. 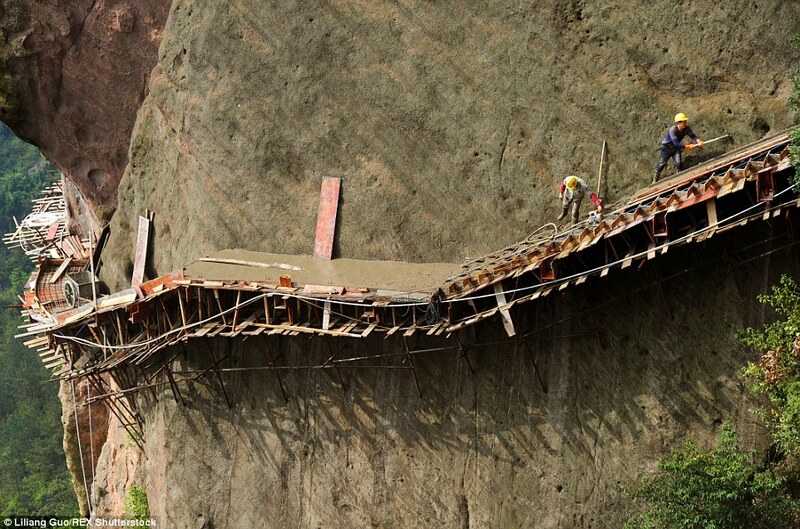 The bridge is only held in place by steel cables which anchor it to the surrounding rocks. This means that the structure actually sways in moderate wind conditions which makes it especially terrifying for those who wish to cross it. Hundreds of visitors get stuck on the bridge annually because they cannot make their limbs move. They become paralyzed by fear and most of them just stop and cling on to the rails for dear life. It is because of this that the tourist board employs specially trained staff who are on duty at all times to help tourists to the other side. Previous article12 reassuring pictures of kindhearted and noble people that will surely restore your faith in humanity! Next articleThis Chinese woman died after falling 5 storeys out of a fire exit which lead to nothing on the other side!